All he wants is to be important, get some respect, and be a rock star. Oh, and go wild and have lots of fun, too. He's a little bit generous and a little bit selfish. Sound like your normal teenager? Almost, but not quite. 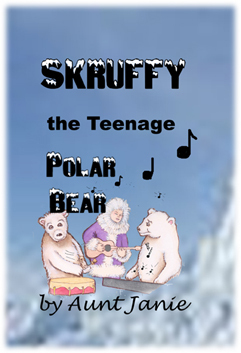 SKRUFFY is a teenage polar bear. Global warming is subtly evident in his misadventures with many colorful characters. including Santa Claus's Elves and reindeer. He's a bit of a jerk that only his mother can love. 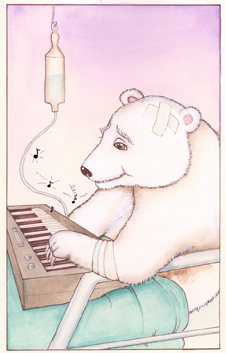 learning hard lessons along the way and becoming, sort of kind of, a better bear. He finally reaches his goal. To download a PDF copy of this book + music put "Skruffy Book " in the subject and email Skruffy.